U of A electrical engineering professors teach Bentonville students about sensor tags as part of the Ignite Professional Series. Electrical engineering faculty kicked off the new year by partnering with Texas Instruments, the Institute of Electrical and Electronics Engineers Ozark Section and four Northwest Arkansas student groups to turn a variety of science-based project ideas into reality. Students involved are from Elkins High School, Bentonville High School, Bentonville West High School and Hellstern Middle School in Springdale. Elkins students are working on an RV park light project, Bentonville students are working on a progressive web app using Vue JS and Springdale students are working on a helmet impact sensor. The projects vary widely in scope and detail, but they're all working toward one goal: collecting data to help others. Bentonville students will work on creating a user-friendly app to help other students collect information for use in assignments or projects. These students are a part of Ignite Professional Studies program, which provides Bentonville students unique learning opportunities by connecting them to professionals in a variety of fields. "By creating this application, our students are able to give something back, and to create opportunities for other students to learn," said Ignite Instructor John Mark Russell. 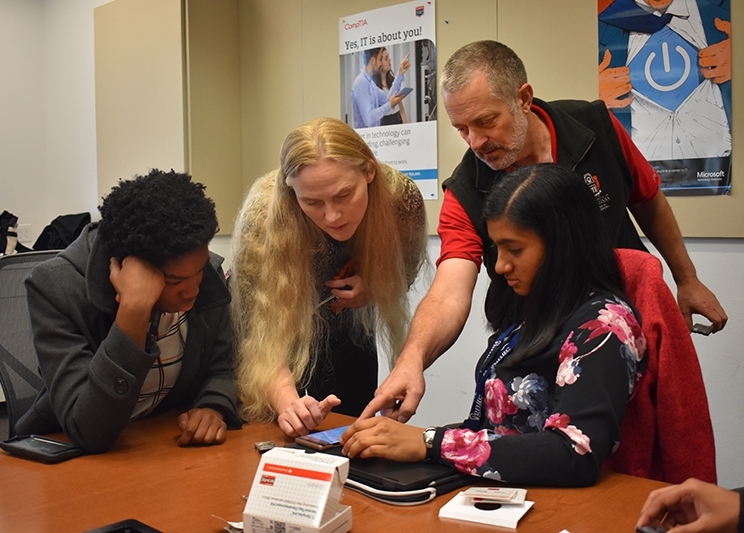 In addition, with support from Texas Instruments, electrical engineering professors gave the group next-generation IoT development kits, also known as TI SensorTag(s), which are devices that help unite sensor data with cloud connectivity. IoT refers to the "Internet of Things," a field of technology dedicated to connecting everyday devices to the internet so they can communicate and work together. Students received TI SensorTags to learn how to collect data. These devices are the same ones used by engineers in large companies. "We are beyond excited to see the next generation of engineers solving real problems using the latest technology from Texas Instruments," said Franklin Cooper, Jr., Texas Instruments regional university marketing manager. Like the Bentonville students, Hellstern Middle School students will use TI's sensor tag to collect data for their impact helmet sensor project. The group's mission is to stop Second Impact Syndrome in students by installing sensors in their football helmets to notify coaches when athletes suffer a serious injury from impact during a game or practice. For Hellstern EAST (Environmental and Spacial Technology) Facilitator Nicole Pena, the project is a chance to bring a complex technology to light for students. EAST is a class in Hellstern Middle School focused on providing students opportunities to make a difference utilizing technology. "Students at the age of 11-13 have an incredibly hard time figuring the building of sensors out alone," she said. "However, [UA electrical engineering professor] Mr. Saunders has given them the tools and knowledge to learn to build." Elkins students will work on designing "smart lights," at an RV park. Students plan to allow the lights to be controlled from a master control panel, or by customers at the park through a web app. The students will assemble prototypes during the spring. Matt Francis, electrical engineering alumnus and founder of Ozark Integrated Circuits Inc., said the IEEE Ozark Section, a local chapter of the IEEE professional association, is sponsoring the students on the RV park project. Francis said opportunities to work with academia and local businesses are important for the students. "I'm excited to see that we're able to create an experience like this for the students in Elkins," Francis said. "It gives them a chance to apply their basic STEM skills to making something real." For electrical engineering department leaders, those skills are important to nurture from a young age. "Electrical Engineering is a passion, so when we meet students with that same passion, we want them to succeed by giving them the right tools to find their path," said Robert Saunders, assistant department head of electrical engineering. Throughout the spring semester, representatives from the department will meet with the students weekly or monthly. Each student group expects to finish their project by the summer of 2019.